I have only been writing my blog for about 5 weeks now. Before, when I came across something I just had to share with my friends, I didn’t have a easy way to do so. Now I can. 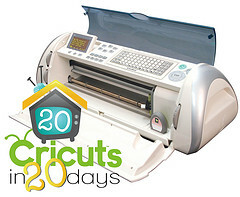 Go, don’t walk, run, to Stacy Julian’s blog post today where she announces a giveaway for a Cricut 2 Expresson. I won’t write about all the details because you can read about them here. But I have the smaller Cricut and really enjoy it. Would love to win this new one. I have followed Stacy Julian’s work since I started scrapping in 1999. She changed my way of scrapbooking from mostly event, chronological scrapping to story telling, everyday-moment scrapping. She is going to be a host on a new web channell called My Craft Channel. I can’t wait. This is one show I plan to follow. This entry was posted in Scrapbooking by Karen Grosz. Bookmark the permalink.